There is no Moin in this article! In southern Germany, it is quite common to say Servus for “hello”. Funny, no? It is precisely in the south of Germany that I’ll take you today! A few weeks ago, my boyfriend and I spend the weekend in Freiburg-im-Breisgau. Freiburg is a city located in southern Germany, in Baden-Württemberg, not far from french and swiss borders. 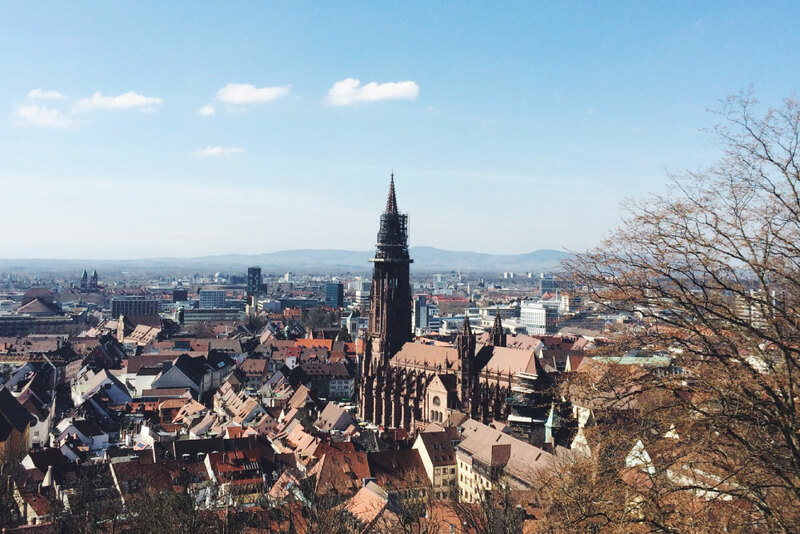 As for Hambourg, I propose you a little guide of good places and stuffs to do in Freiburg! Los geht’s* (Let’s go)! Freiburg is a beautiful city, it is crossed by the river Dreisam and is located in the foothills of the famous Black Forest. We stayed with a friend of ours and it turns out that his apartment has a great location near the old town and at the foot of the Schlossberg, a forest (what a sweet name). I’ll be honest with you: I think that Freiburg is a super nice town with small houses typically German, all that stuff, but it’s just … too perfect. It’s almost boring. I don’t know how to explain, but it’s a general feeling that I had. Sorry for the people who live there but I prefer the landscape of the Ruhrgebiet (the industrial region near Düsseldorf/Essen/Dortmund); at least it’s authentic and true, even if it’s not very pretty, filled with abandoned factories and its weird people. We arrived on Friday night by train; The train in Germany is relatively expensive, it’s better to book your tickets early enough or to benefit from a promotion from the Bahn (the German trains). That’s what we did! We left the car at home and we travelled from Düsseldorf to Freiburg in 4 hours. You can go around by bike! Go have a walk in the Old Town! You think that everything is vintage? Well, not at all! Everything, except the cathedral, was destroyed in 1944 and rebuilt according to the old plans of the city. Quite cool because we don’t see the difference at all. Be careful not to fall into the Bächle; those small open gutters on the sidewalks. Apparently in the summer, people put their feet inside that. They say that if you fall in a Bächle, you will marry someone of Freiburg (not for me, thank you). Little trekking day in the Schlossberg. Go on top of the Schlossberg (the mountain in the city center). I know it’s hard but you will find a beer garden to reward you! What is a Biergarten? According to my boyfriend, the best-and-only invention from the Bavarians (there is a small inside war between North and South of Germany, they are not too fan of each other – as in Belgium). A Biergarten is a terrace/bar where they serve drinks (beer!) and food (grilled Bratwurst). You don’t want to buy anything? You can bring your own food! And you have a great view of Freiburg! Drink a Radler, a beer mixed with lemonade. It’s fresh, it’s good! Does it count as alcohol still? Do a little trekking through the Schlossberg. I did it, I almost died and I’m scared of heights but it was nice! Go to the local market (Markthalle). It’s a bit pricy but it’s nice! If you’re bored on Sunday (like us), take your car and go to the Naturerlebnispark Mundenhof. It’s a free zoo (in fact, you have to pay 5€ for the parking but otherwise it’s free). The animals are in huge open enclosures, there are llamas (❤️), buffalo, lemurs, birds, guinea pigs, .. It’s really neat to walk around. If it rains, there are several museums in Freiburg! In front of the Cathedral and the Historical Merchant’s House. Check out the old and new City Hall (Altes Rathaus & Neues Rathaus) but also the Historical Merchant’s House (Historisches Kaufhaus). On Saturday, there is also a small local market. Walk along the Dreisam river. This is where all the real Freiburgers spend their sunny afternoons. “The potatoes’ house” is a cool name, right? That says it all, it is a restaurant focused on potato, in all these states! Nothing can make me happier  In good German I became, I took a Schnitzel-Pommes (a huge piece of typical breaded meat with fries). My boyfriend, as a true German, took a Wurstsalat-Bratkartoffeln (a sausage salad with fried potatoes, a whole program) and our friend had a potato gratin. Everything is served with a salad on the side. It costs between 1€0 and 15€ per dish. I highly recommend you this restaurant, especially if you are really hungry! It’s good, served in big portions and cheap! Btw, better to book a table, it’s really full all the time. Another funny name! Mehlwaage is the name of the balance for flour. The restaurant is located in the middle of the old town, we were sitting on the terrace since it was super nice outside and it’s really super cool to stay! The specialty of the house? The flammekuche! I had some reluctance to try their flammekuche because my boyfriend make the best flammekuche in the world (in my opinion) but we shared a Flammkuchen mit Rahm, Bärlauch, Kartoffeln und Käse (cream, garlic, potato and cheese). It was not bad, but less good than at home  We also tried the Käsespätzle mit Bärlauch. The Spätzle is the german pasta. It tastes like Italian pasta but looks like gnocchi. It was not too bad either, with cheese and garlic! The dishes are between 7€ and 10€, which is relatively inexpensive! I advise you to go there in good weather and sit outside! All dark, old, filled with students. That’s how we can describe the Café Atlantik. Drinks (including cocktails) are cheap, they serve food all the time, including spaghetti that really looked good! The best? It’s really cheap too! It’s 3.90€ for a small dish of spaghetti, 4.90€ for the big one. They also serve many vegetarian dishes. Super nice if you’re a little short on money and you’re not too fussed with the decor. Here it is! I hope you enjoyed this blog post! Have you ever been to Freiburg? Do you know other addresses? If you go to Freiburg, let me know;) See you soon for more travels! Tapas Trip à Madrid !